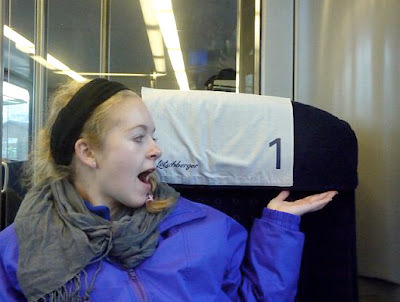 To Europe With Kids: Do You Need Train Reservations? I love the ol' hop-on hop-off days of train travel with a Eurail Pass in Europe. Those were the days when you really only had to make a reservation on a train if you wanted a sleeper couchette. Hop-on hop-off still exists in many European countries, but some, such as Switzerland and Spain, insist on seat reservations on all but small, regional trains. It takes some of the spontaneity out of train travel. What surprised me when traveling in Switzerland last winter was that seat reservations were not as necessary as I was led to believe. We were traveling with a Swiss Pass and I had only booked seats on our two major travel days from Zurich to Adelboden and back again. (And the cutest thing was that our Rail Europe travel agent had booked our group of 11 a whole car by having this paper sign taped to the windows!) We took other long train rides (Frutigen to Gruyères, for example) and just simply boarded without reservations, no problem. On a 2nd class train car in Switzerland. In Spain this summer we didn't have rail passes so naturally got a seat assignment when we purchased our tickets, but it didn't seem to matter where we sat on the regional trains (Seville to Córdoba, for example). In Portugal we took a few train rides out of Lisbon and didn't need seat reservations. Certainly all high-speed trains such as TGV, ICE, Eurostar, Thalyes, AVE and others require seat reservations. Even if you have a rail pass be sure to purchase (there's a surcharge) a seat reservation before boarding. Another thing that's changed from "the old days" of European train travel is that there's not much difference between 1st and 2nd class cars anymore now that most seating is "bus style" as opposed to train compartments. Sure, the seats are a little wider in 1st class, and we were shocked to be served a complimentary box of sushi, of all things, on a 1st class ride from Paris to Cologne. And sometimes you just get lucky: when my Girl Scout troop and I were headed to the Zurich airport for our flight home, one of our connecting trains was delayed. A very kind Swiss train attendant knew we were nervous about catching our plane, personally led us to another train, and seated us in 1st class for the rest of our journey. The girls felt very special! Hey Sonja just come across this post glad you had fun going by rail in Switzerland. You touch on a useful point and that is that in the 'old days' a pass really did mean hopping on and off. With so many more high speed connections, you now have to factor in supplements like seat reservations. Very true - we definitely found it cheaper to buy advance point to point tickets for Spain (and they were significantly cheaper on renfe.com). Thanks for the comment and the link to your useful post!